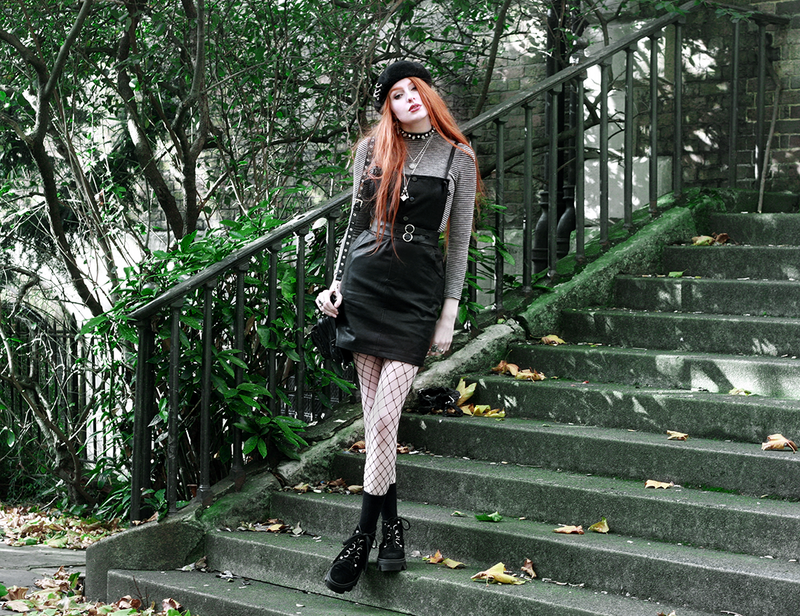 For this beret look, I embraced the Parisian vibes with a cute vegan leather dungaree dress and stripes. I picked the dress up super-cheap in a sale a little while ago, though looking for something exactly like it for years! Annoyingly it’s now sold out so I can’t link it, and there’s not that much similar out there at the moment 🙁 I bet you could find something similar in a vintage/secondhand store though! On that note; I noticed as I was finding item links for this post that a lot of what I’m wearing here is no longer available. I’m so sorry I can’t always link the exact things I wear! I recycle so much of my wardrobe over the course of years & I’m such a sale shopper, especially last minute bargains! Wherever I can I try to link pieces that are as close as possible to what I’m wearing though. Previous Post Styling Up Studded Shorts for Cold Weather. Next Post AHS Coven Vibes in Deandri.